With 12 genres and influences, cities, and scenes, Music + Travel Worldwide guides music fans across an insightful, international stage of sounds to help plan where to go and what not to miss. Curated by experts in the industry, the book travels to Russia to experience the country's long and inglorious outlaw culture's sounds of chanson; heads to Buenos Aires to witness the development of cumbia, from the lavish '90s to its latest digital incarnation; goes "underground" to check out Beijing's ever-evolving, highly influential experimental music scene; and gets into Berlin's private clubs that are playing the offspring of techno. 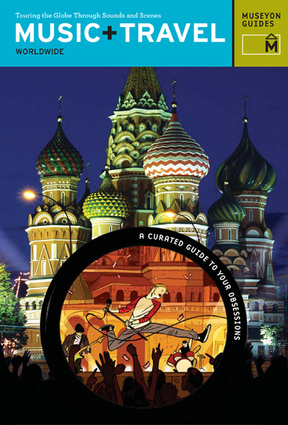 Loaded with sidebars and useful trivia about musicians, discography of artists' albums and 100 festival locations, a timeline of historical events for each of the 12 genres, and detailed maps of venue locations, this book is perfect for the travel lover or the musically obsessed.